Quirky NY Chick: Edward Sharpe and The Magnetic Zeros - "Life Is Hard"
Edward Sharpe and The Magnetic Zeros - "Life Is Hard"
Edward Sharpe and The Magnetic Zeros recently released a video for the song “Life Is Hard”. Check it out below. 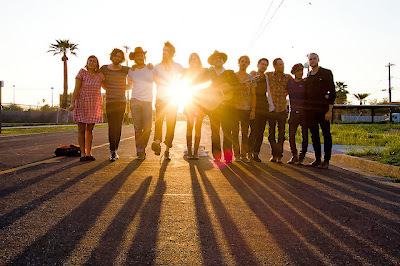 Edward Sharpe and the Magnetic Zeros are premiering an all new video for the single "Life Is Hard" today via BigSunFoundation.org. The video features an acoustic version of the song, recorded live at WVUF in New York, set to the World Press Photo Contest winners of 2013, held yearly to showcase the highest standards in photojournalism and share them with millions. Lead singer Alex Ebert said of the collaboration, "On some sleepless and homeless night, towards the end of my first trip to Amsterdam, I stumbled into what perhaps was a cathedral. It must have been midnight or thereabouts, but it was aglow and bustling. I entered and never forgot the experience not the name of the experience - it was an exhibit of World Press Photo winners. Years later, I am honored to have been given permission to put some of the photography from this year's winners to an acoustic recording of a song that means a lot to me called 'Life Is Hard'."